The little tank above this water heater is an expansion tank and it plays a very important role in your plumbing system. Water heaters are important parts of modern homes. Life would be a lot harder without the constant flow of hot water for bathing and washing our dishes and clothing. Have you taken a look at your water heater lately? Sometimes, there is a small tank connected to the larger heater tank by piping called an expansion tank. What is this smaller tank’s purpose? Today we’re going to explore the role of the expansion tank in keeping your water heater and, by extension, your entire plumbing system, working properly. The expansion tank is installed on the water supply pipe that supplies the water heater. Water expands as it is heated, and without the room to expand it increases the water pressure in your system. Expansion tanks contain air and can take the flow of expanded hot water by compressing the air and making room for it. This helps regulate the water pressure and make it consistent. Why Are Expansion Tanks Necessary? In the past, this added water pressure was released by pushing some of the water out of the house and into the public water main line, which was able to absorb this additional pressure. Nowadays, however, this mechanism does not work owing to the prevalence of backflow preventers and check valves. These have been necessary additions to plumbing systems for years. Check valves keep water flowing from outside of the house through the service pipe. They help prevent contamination from a home or business from making it to the public water supply. So, plumbing systems need a different way to make space for expansion or else it can place a significant burden on fixtures and pipes. 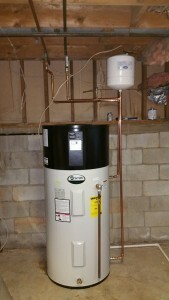 If you have noticed that the washers in your plumbing system wear out very rapidly or if water is dripping occasionally from the relief valve of your water heater, you may benefit from having an expansion tank installed on your water heater. Consult a plumbing professional as soon as possible! This entry was posted on Thursday, December 1st, 2016 at 2:13 pm. Both comments and pings are currently closed.